This chapter presents a methodology for creating synthetic interest point detectors through the paradigm of genetic programming. After a quick review of the state of the art, we describe three different criteria for evaluating the performance of feature detectors. 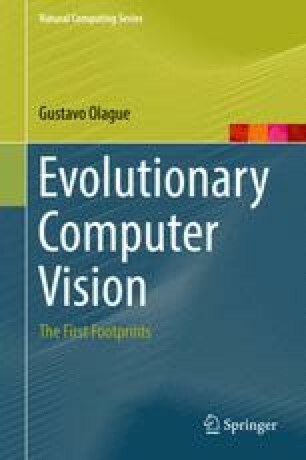 Next, the evolution of image operators is explained using single and multi-objective approaches. The design of interest point detectors is achieved through the formulation of an appropriate search space and evaluation functions, as well as the overall design of the evolutionary algorithm. The proposed strategy has the advantage of providing numerous interest point operators with new, unique, and unorthodox designs. The analysis of those best detectors gives us the advantage of achieving a higher level of creativity and fostering human-machine innovation in this research area. Experimental results regarding stability, information content, point dispersion, and finally the computational cost are provided to illustrate the generality and usefulness of our approach in real-world images.